Click here to view this newsletter in its proper format. ► Whose World? OUR World! • January – mass revolutions spread across the Middle East. • February – thousands of Americans occupy the Wisconsin legislature to protest anti-union, anti-worker laws. • March – a catastrophic nuclear meltdown destroys a supposedly “safe” reactor in Japan. • Spring and summer – millions of Europeans demonstrate their refusal to accept less so the rich can have more. • September – the Occupy movement begins in New York City, spreads through the US and around the world. Whatever the shape, composition and demands of these movements, the common denominator is CLASS ANGER – the rage of the oppressed against their oppressors. For decades, cynics have sneered that people like the way things are and will never fight back. Clearly, they were wrong. The majority will suffer injustice for only so long. At some point, suppressed anger will erupt like a mighty river, flooding the land. The Occupy movement has opened a Pandora’s box of questions and created a social space where we can create solutions to the problems that plague us. Supporters of capitalism condemn the movement. They point to its limitations, dismiss its significance and pray it will pass. They fear its revolutionary potential. In Oakland, riot police have attacked, beaten and shot protestors, exposing the lie that we live in a democracy, that we have the right to assemble without our masters’ permission. But protest we must, because capitalism is ruining everything good in this world, robbing us of joy in the present and hope for the future. Our goal is to harvest the grapes of wrath – to end the rule of the few and the misery of the many, to proudly proclaim the obvious: that working people create all social wealth and have the right to produce it for the benefit of all. Susan Rosenthal is a Toronto-area physician and the author of POWER and Powerlessness (2006), Professional Poison (2009) and Sick and Sicker (2010). May 15 marked the uprising of anger in what some people call the Spanish revolution. Young people who were camping in the public squares used the summer months to organize and spread the movement to the neighborhoods and to hold marches in the cities and towns throughout Spain. On October 15, Barcelona converged with other global cities in an international day of struggle against a savage capitalism that is destroying the social gains of the past. More than 200,000 people took to the streets, crowding the avenues with signs protesting cuts to health care, education and social services and demanding decent jobs with benefits, quality public services and an end to political corruption and the greed of the financial sector. These slogans are similar to slogans raised in other cities around the world. 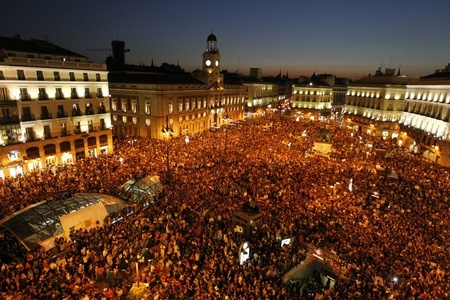 What is remarkable is the mass character of the protests in cities like Madrid and Barcelona. Protestors strongly disapprove of how the Spanish government of the PSOE has been mis-managing the capitalist crisis. People are outraged that the largest share of the pie is going to the rich, leaving more than a quarter of the Spanish population in poverty. Several million people are unemployed and most young people face a dire future. 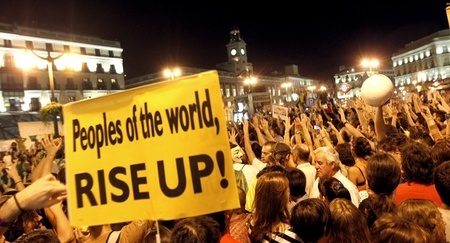 Popular protest against the financial crisis has reached an international scale! People in over 950 cities and 80 countries oppose the banking industry and the politicians who support it. After October 15, nothing will be the same. Sergi Raventós works in a non-profit mental health foundation and is studying for his doctorate in Sociology. He is a member of Dempeus and International Health Workers for People Over Profit. The Occupy movement has spread to the suburbs! Marin County, California is one of the most affluent counties in the state but residents here are certainly not immune from the economic depression. Like the rest of the country, homes have been foreclosed, businesses have been shuttered and people have lost their jobs. Twenty somethings who often have college degrees are moving back home with their parents because they can’t find work and can’t pay their college loans. So it was no surprise that the Occupy Marin event on October 15th drew over 300 people. Held in front of The Bank of America building in downtown San Rafael, the event was spirited and the signs creative. Most passing cars honked and waved. A police car was parked nearby, but didn’t interfere. Marin County has an active Peace and Justice Coalition that has organized protests opposing the wars in Iraq and Afghanistan as well as the ICE raids that traumatized the immigrant community. However, the Occupy Marin event included new faces, young and old alike. The Occupy Marin movement plans to take to the streets every afternoon. Eileen Prendiville works as a staff nurse in a San Francisco hospital. She belongs to the California Nurses Association, a member union of National Nurses United. This was us – about 50 throughout the day – 5 overnight. The plan is to continue the occupation as long as possible. The 12 young people who launched Occupy New Plymouth were astonished so many “old” people would come out to support them. New Plymouth has a population of 55,000, and they had no idea there was an established activist community here. Occupy New Plymouth is in its 8th day of occupation at Huatoki Plaza. The majority of occupiers are age 17-19, with strong support from older activists and the community providing food, camping gear, and even money. We had a 30 minute interview on Access Radio yesterday, and we had three articles in the Taranaki Daily News in the past week. The last was a very favourable lead article on the News page, written after our 17-year-old spokesperson wrote a response to an extremely nasty editorial column. Stuart Jeanne Bramhall is a retired American physician living in New Zealand. 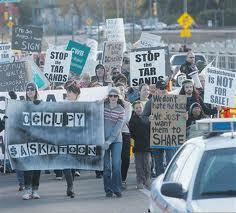 Occupy Saskatoon had a strong demonstration on Oct 15th, and people are still camping out in Friendship Park downtown. A major focus of Oct 15th was the University of Saskatchewan’s Senate meeting where activists charged conflicts of interest regarding corporate involvement at the university. Particularly highlighted is the involvement of Cameco, one of the world’s largest uranium corporations, with nuclear research at the university. On October 21st, Occupy Saskatoon joined with the Saskatoon Anti-Poverty Coalition. About 300 people joined hands across the city bridge in solidarity. Jane Edgett is an injured healthcare worker and founding member of the Canadian Injured Workers Society. On Friday October 7, after two General Assembly meetings, about 350 Hartford area residents marched through downtown during rush hour to their chosen occupation site, a triangle of land with a view of the state capitol and several major insurance companies and banks. Since then, the physical occupation has been continuous with between 10 and 30 “dwellers” staying overnight. The challenges of setting up and maintaining a “village” and the consensus-based decision-making process have been a struggle, but people are learning. As of this writing, the city is allowing the occupiers to remain despite city code violations, thanks, in particular, to the two Working Families Party members of the town council who are involved in the movement, as well as the mayor and town manager who are fairly sympathetic. Many of the occupiers have never been involved in public demonstrations, and the crowds at demonstrations are more diverse than they have been in a long time. The movement has wide support. People living and working downtown often stop by to learn and/or offer support and encouragement. Passing cars honk in support with great frequency. “We are the 99%” clearly resonates as a mass slogan. Unions, students and faculty organizations have endorsed the Occupation. Last weekend, Occupy Hartford joined with the local Bring Our War Dollars Home group for a rally and march at City Hall. Midweek they joined with the Working Families Party for a demonstration in front of the Hartford Insurance Company which has taken tax breaks from the city at the same time it is laying off workers. Members of Occupy Hartford also joined a weekly demonstration of Minority Construction Workers to protest discriminatory hiring practices on the water company’s multi-billion dollar Clean Water construction project. Upcoming plans include a student walk-out and march to the Occupy site, an interfaith justice workers meeting, teach-ins, music events and a more developed campaign against some of the most egregious corporate criminals. So far health workers have not been present as a group, and that is just some of the work to be done. Lucy Rosenblatt works as a psychotherapist in Hartford and West Hartford, Connecticut. 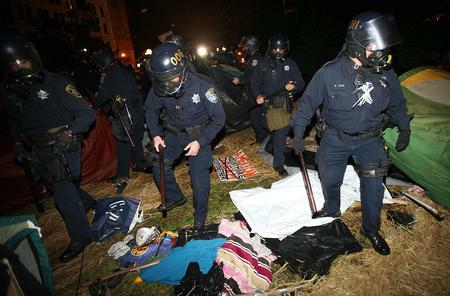 On October 25, Oakland city police and a dozen other law enforcement agencies unleashed a savage assault on the Occupy Oakland encampment, shooting rubber bullets and tear gas into the crowd and arresting more than 100 people. Scott Olsen, a 24-year-old Iraq War veteran and member of Iraq Veterans Against the War was left in critical condition after his skull was fractured by a police projectile. The next day, several thousand people reclaimed the Occupy Oakland encampment in front of City Hall. On October 28, Egyptians demonstrated their solidarity with Occupy Oakland, marching from Tahrir Square to the US embassy in Cairo. In New York City, 10 protesters were arrested during a march in solidarity with Occupy Oakland. A new poll shows that most New York state voters, and even more New York City residents, support and understand the grievances of Occupy Wall Street. Divestment and Sanctions Campaign against Israel. We oppose Israel’s repression of the Palestinians and support a single state in Israel/Palestine with equal rights for all.